On Saturday, April 14th, at the Association of Women in Agriculture (AWA) annual AWA Day, the AWA alumni awarded 20 scholarships to undergraduate active AWA members, totaling over $11,000. Four Dr. Larry Satter Memorial scholarships were awarded, with Brooke Moore, a Food Science major from Gratiot, Wisconsin; Molly Hendrickson, a Life Sciences Communication Major from Hollandale, Wisconsin; Emma Olstad, a Dairy Science major from Stoughton, Wisconsin; and Madeline Selner, a Life Sciences Communication and English Language and Linguistics major from Denmark, Wisconsin all selected as recipients. The Dr. David Dickson Memorial scholarship was awarded to Riley Miller, a Dairy Science major, who hails from Evansville, Wisconsin. Stephanie Thiel, a Food Science major who resides in Plymouth, Wisconsin was selected as the recipient of the Delma Woodburn Memorial scholarship. The Cynthia Benevenga Memorial was awarded to Rebecca Shilts of Orfordville, Wisconsin, who is majoring in Dairy Science. Three AWA House Resident scholarships were awarded, with Noelle Austin, a Pre-Pharmacy student from Belleville, Wisconsin; Julia Oelke, a Genetics major from Merrill, Wisconsin; and Summer Henschel, a Dairy Science major from Elkhart Lake, Wisconsin all selected as recipients. Six AWA Active Member scholarships were awarded to students who have demonstrated a high level of commitment to AWA. These recipients include: Rachel Gries, a Dairy Science major from Manitowoc, Wisconsin; Emily Franke, a Dairy Science major from Oakfield, Wisconsin; Rachel Gerbitz, a Dairy Science and Life Sciences Communication major from Eau Claire, Wisconsin; Keisha Verbeten, a Dairy Science and Agronomy major from Wrightstown, Wisconsin; Brooke Trustem, a Dairy Science major from Evansville, Wisconsin; and Stephanie Hoff, a Life Sciences Communication Major from Thorp, Wisconsin. Three $1,000 scholarships, which are provided in support by the Daughters of Demeter, were awarded to Amber Dammen, a Dairy Science and Life Sciences Communication major from Argyle, Wisconsin; Ciera Ballmer, a Dairy Science major from Janesville, Wisconsin; and Emily Matzke, an Animal Science and Life Sciences Communication major from Sauk Prairie, Wisconsin. The Nicole Bangart Memorial Scholarship was awarded to Kate Vickerman, a Genetics and Life Sciences Communication major from Milton, Wisconsin. The Kelsey Olson Memorial scholarship recipient was Elizabeth Sarbacker, a Dairy Science majoring hailing from Verona, Wisconsin. Lastly, awarded for the first time this year, the Grateful Badger scholarship was awarded. This award will rotate each year between AWA and Alpha Gamma Rho-Iota (AGR). This scholarship is made possible by AWA and AGR alumni, Krista Knigge and Corey Geiger. The inaugural recipient of this award was Jessica Wendt, an Agricultural Business Management major from Stoughton, Wisconsin. 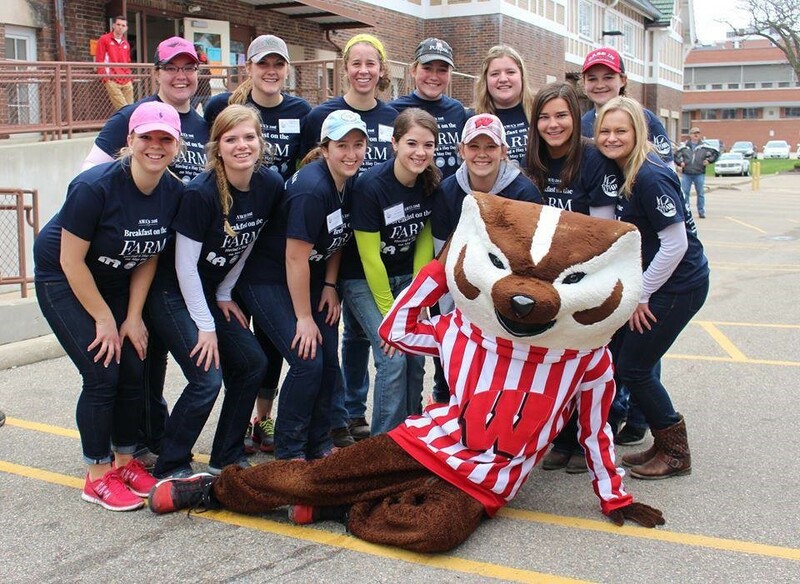 The AWA alumni are proud to provide continuous support to active students as they attend the University of Wisconsin-Madison and achieve their goals. Thank you to the Daughters of Demeter, the Grateful Badgers, and the generous AWA Alumni donors that have made the scholarship program possible.